Sedums are perennials which have very thick and succulent leaves, flowers that come in clusters, and fleshy stems. You can use sedums as many things in your garden, from border covers to ground covers, depending on their height. There are many sedum varieties as well, which means that you have plenty of options to choose from. These plants are hardy even in cold temperatures, attractive to look at, drought tolerant, and pest resistant, which makes them the perfect choice for almost any household in a wide variety of climates. Today, we’re going to teach you how to grow your sedum ground cover and protect your soil while also making it look nice. Before thinking about planting sedum ground covers in your garden, it’s important to find out more about this type of plant. As we’ve already mentioned, there are quite a few sedum varieties out there, some of which can grow quite low (2 inches) and which are perfect for ground covers, and some of which can develop up to 2 feet or even more. The taller varieties are lovely additions to perennial borders. Their flowers are larger and their foliage is denser. Speaking of flowers, sedums come in multiple colors, ranging from yellow to red, gold, pink, or white. They typically bloom in either late summer or early fall, depending on the variety that you choose and on whether or not they’ve been exposed to a well-drained soil. Especially in summer, when the weather is extremely hot, sedums tend to catch fungal diseases. This is why you have to make sure that the soil you plant your sedum ground cover in drains well. Sedums have a couple of special features that make them popular both as a ground cover and as a perennial border cover. For instance, probably the most attractive thing about sedums is the fact that they’re extremely low-maintenance and easy to take care of. They’re able to thrive in full sunlight, they resist low temperatures, can remain strong and endure droughts, and they’re even forgiving of bad soil. All in all, they’re one of the best plants that you can grow if you’re a beginner gardener and want to test out your abilities. Another great thing about sedums is their beauty and colorfulness, which makes them very nice cut flowers. Especially if you’re going to plant tall varieties, you’ll be able to cut part of the flowers and decorate your home with them without worrying that this will deplete the plant of its blooms. Sedums grow enough blooms to decorate both your home and garden. Moreover, their blooms are not the only thing that serves as an attraction. They also have a rather unusual and unique foliage which looks great by itself. In the case of small sedums, the foliage can be copper, blue, maroon, yellow, and more. This is usually what draws attention to them most. Of course, small varieties also grow attractive flowers, but they’re understandably smaller and they don’t last long. 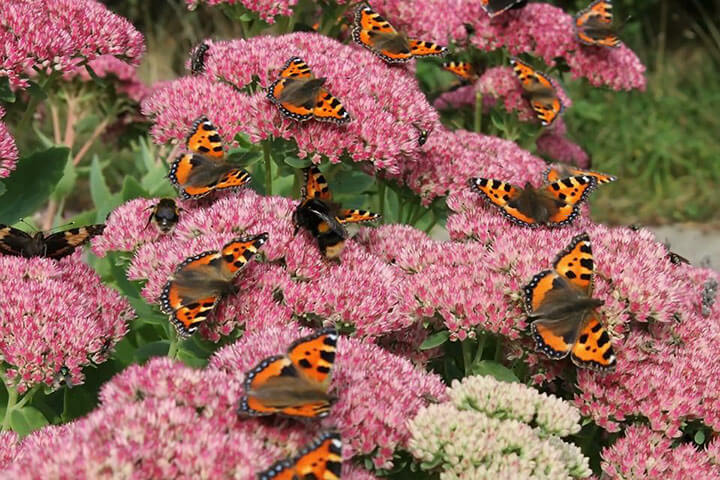 If you want your garden to be butterfly-friendly, then planting a sedum ground cover is a great idea for you. Sedums attract butterflies, thus enriching the ecosystem of your garden. The way a plant is going to grow and develop depends a lot on the moment you plant it. If you want your sedum ground cover to thrive, you should plant it in early spring. That way, the plants will be the main attraction of your garden in fall. When it comes to the perfect place to plant a sedum ground cover, we advise you to choose an area that gets plenty of sun but also partial shade. The ideal conditions to grow a sedum ground cover involve a mostly sunny place and a well-drained soil. However, if this is not something you can offer all plants in your garden, you can always sacrifice sedums in favor of plants that won’t grow without certain conditions. There’s a reason why people also call sedum stonecrop. That’s because they like to joke about the fact that the only things that live as long and require as little care as sedums are stones. An important thing to remember is the fact that even if sedums are easily adaptable to almost any type of outdoor condition if the soil where you plant them is extremely wet, they might rot. If you know this is the case in your garden, we recommend you to consider raised beds. Other than that, if you have hillside slopes or a rock and crevice garden, your sedum ground cover should develop just fine. When it comes to actually planting your sedum ground cover, you have two options. The first one is to plant sedum seeds and the second one is to plant sedum cuttings. Let’s see what you have to do for the first option! Your seeds should be placed in the ground about 6 inches apart. That’s because the ground cover sedum varieties are quite small and don’t require a lot of space to grow and develop. The soil should be loose enough, so we advise you to use a tiller and go up to 15 inches deep. After you’ve done that, you can mix the top inches with some compost as well. Then, simply spread the seeds making sure you don’t place too many in one spot. If you already have a sedum plant, either outside in your garden or inside, or if you’ve just bought a sedum in a pot and you want to propagate it, you can do that by using its cuttings. What you have to do first is snip off a piece of the plant. The piece shouldn’t be longer than 5 inches. Then, you’ll have to plant it in well-drained soil and water it thoroughly, just like you would any other annual. If you’re wondering how deep you have to plant the cutting, the answer is that depth doesn’t really matter. Both deep-planted and shallow-planted cuttings develop a strong root system in the end. Still, the ideal depth would be of 1 inch. You’ll notice that it only takes a few weeks for the cutting to form roots and start to develop. When the cutting has formed a tiny plant by itself, you can transplant it in your garden. Since now you’re planting an actual plant instead of some seeds, you’re going to need to make sure that you create a hole that is twice the diameter of the container your sedum ground cover plant was in. If you’re planting more than one sedum, make sure you leave plenty of space between them. Also, remember that the top of the root ball of your plants should be at soil surface level. After you’ve placed the plant in the hole, use soil to cover the space around it. Then, water it as needed. A soil cover is not always necessary when it comes to a sedum ground cover. Most such varieties are so strong that they’ll develop roots wherever they meet the ground. That saves you the trouble of having to make sure they’re firmly rooted there. Fortunately, when it comes to sedum care, there’s not much you have to do. Still, there are some tips and tricks you should remember for the benefit of your plants. 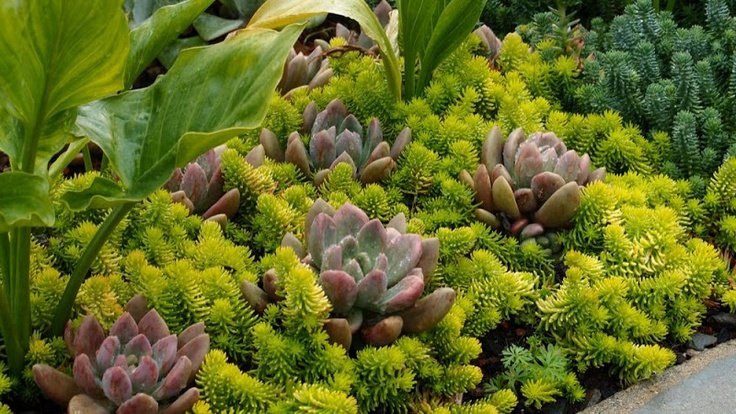 For example, most ground cover sedums are tolerant of drought. This means that you don’t have to water them that often. This is especially true during winter since they might rot otherwise. Sedums are able to grow better without much water than if you water them more than necessary. The same goes for fertilization. Even if you should gently fertilize their soil every spring by mixing it with some compost and mulch, you mustn’t overdo it. This might do more harm than good. Your best bet would be to choose an organic fertilizer. Try to stay away from chemical fertilizers, because they might damage your plants. 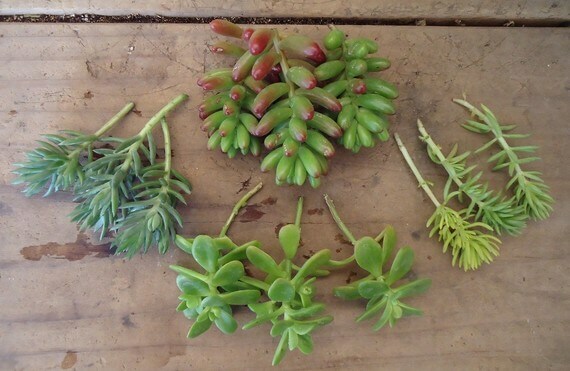 When it comes to pruning, it all depends on the type of sedum you have in your garden. Smaller sedums don’t really require pruning unless you notice them invading your garden more than you want them to. You can prune taller sedums in spring so that they don’t grow too tall. Just keep in mind this means they’ll bloom later than usual. A sedum ground cover is a perfect addition to any garden that requires some protection. Not only will it make sure your soil doesn’t get invaded by weeds or pests, but it will also provide your garden with a gorgeous colorful look, depending on the sedum varieties you choose. Moreover, you don’t need a lot of gardening knowledge to take care of them. What more could you possibly wish for in a ground cover plant? If you’re curious about some other types of ground cover plants and the benefits of growing them, make sure to take a look at one of our previous articles where we talked precisely about that.